Arriving at this year’s Baselworld, you were greeted by the extravagant, new hall complex designed by Swiss architects Herzog & de Meuron and completed in time for the show. 1,460 exhibitors from 40 countries presented their novelties at this 41st international watch and jewelry show in Basel, Switzerland, from April 25 to May 2, 2013. 122,000 visitors and 3,610 media representatives from 100 nations came to Basel to find out about the latest trends from the watch and jewelry industry and to network. This represents a new attendance record for the trade show. With its new show concept, Baselworld has adapted to the fact that the worlds of watches and jewelry are becoming more and more intertwined. Some of the brands represented at Baselworld 2013 are Breguet, Breitling, Bulgari, Chanel, Chopard, Dior, Gucci, Hermès, Hublot, Louis Vuitton, Omega, Oris, Patek Philippe, Rolex, Swarovski, Swatch, Tag Heuer, Tissot, Tudor, Versace and Ulysse Nardin. Casio took advantage of Baselworld 2013 in order to announce the release of three new additions to its SHEEN family of watches for women. The new SHE-3504 models feature a dial studded with Swarovski Elements. At its press conference on April 25, the company gave its latest watch brand SHEEN an authentic face—actress and model Elisabetta Canalis. The brunette, 34-year-old beauty, who is also known as ex-girlfriend of George Clooney, represents feminine elegance, style and self-assurance—just like the SHEEN brand. On Twitter she (@JustElisabetta) wrote, “Happy and proud to be the european brand ambassador for #Casio #Sheen #BaselWorld instagram.com/p/Yh08qDk0_n/“. The link leads to her Instagram picture, in which she wears a SHEEN. Celebrity guests were making appearances here and there. 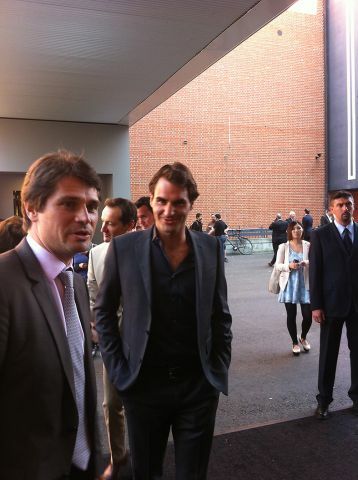 Tennis star Roger Federer is Rolex brand ambassador and stopped by the Swiss watchmaker’s booth on April 25. He was spotted outside the trade show halls by the Baselworld team, who tweeted the picture to the left. The former extreme sport athlete Felix Baumgartner, made famous by his jump from the stratosphere, visited Zenith as their brand ambassador. American music producer Swizz Beatz presented new headphones at the Hublot booth and helped announce the new creative partnership between the watchmaker and the headphone manufacturer Monster. Even before the official opening ceremony for the new hall complex, about 1,000 media representatives were invited to an event on April 23, where American singer Lana del Rey gave an exclusive concert. A true novelty was the Type 3 presented by the Belgian watch label Ressence, founded in 2009. This watch, designed by Benoît Mintiens, features orbiting discs which indicate hours, minutes and seconds. These discs are bathed in a fluid, creating the illusion of the dial floating freely on top of the domed sapphire crystal. This is a phenomenal effect. The design is abstract and minimalist. This model with numbers and indicators in neon green is especially cool. 1. The affordable entry-level price segment is booming. The Italian jewelry brand Ti Sento Milano is one representative of this trend. This year, the brand celebrates its 10th anniversary and presented its Ti Sento 10 Fabulous Years Collection. This collection of ten rings made from rhodium plated sterling silver, some with gold plated details, is presented in a packaging which looks like a box of fine chocolates. 2. Mixing & matching as well as stacking jewelry is “in”. Many jewelry manufacturers offer collections with pieces which are great for mixing and matching and which you’ll want to wear stacked on top of each other. Multiple rings on one finger, multiple bracelets in various tones stacked on your arm or multiple ear piercings in one ear are a fashion statement. The Brazilian jewelry label Brumani is one example of this trend. The bracelets from the Boabab collection—the ones in this image come in 18k yellow and rose gold with brown and white diamonds, pink, smoky and lemon quartz, pink tourmaline, ruby mandarin garnet and aquamarine—are a testament to the Brazilian lifestyle. It is finally getting much easier for fashion-conscious men to find jewelery that matches their type. The selection increases year by year. At Baselworld 2013, British jewelry designer Stephen Webster, for example, presented his new men’s jewelry collection. The engraved, polished and rhodium plated sterling silver elements have a very masculine appeal.